Ideally yes. We like to make sure that we are prepared for you and especially for weekend or late night appointments, as these tend to get booked up very quickly. Yes. We charge a fee of £25 that will be deducted from the price of the dress you purchase. If you do not purchase a dress from us, the fee is non refundable. If you are unable to keep an appointment, please let us know, so we can give it to another client. 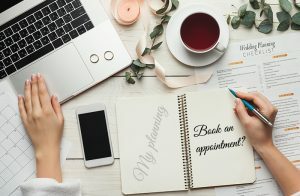 How many guests should I bring to the appointment? We like to make sure that all guests are comfortable, and in our experience it can be a little overwhelming to have too many opinions so we would suggest no more than 3. However more can be accommodated if needed. Please advice of the numbers of guests you wish to bring at the time of booking. How much does a wedding dress cost at Nivaldo? The price of our wedding dresses ranges from £500 up to £6000, depending on the complexity of the model, the quality of fabrics, laces, breads and the amount of handcrafting involved. The vast majority of our dresses are priced between £1000-£2000.